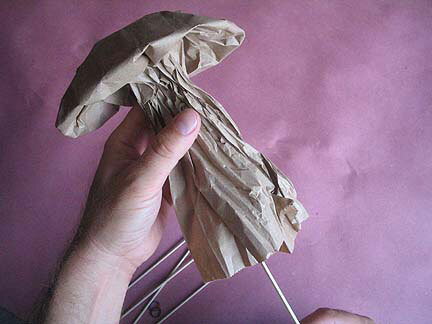 Get your classroom or group of friends, co-workers, relatives or inmates together and make a bunch of mushrooms! Make as many as you can. 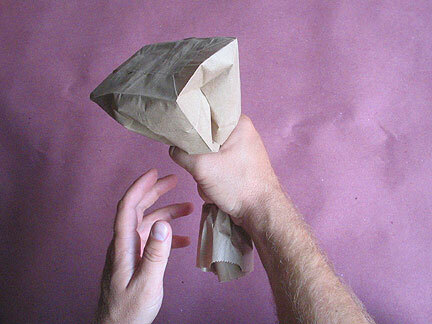 then plant them in your school yard, your lawn, your friend’s lawn, a neighborhood park … wherever people will see them. 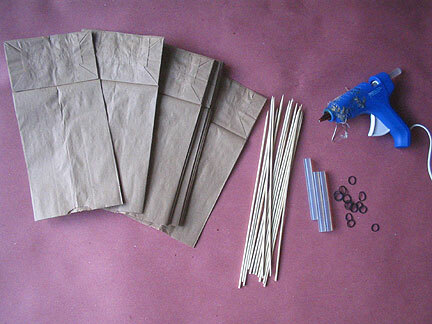 …as well as step by step instructions below. 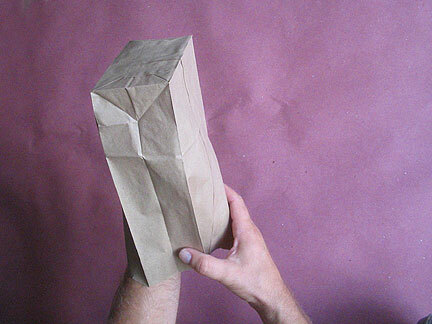 Okay, first take a bag and open it up. 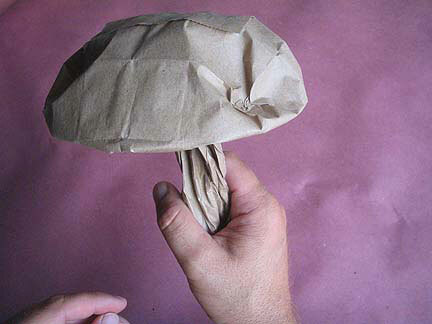 …then using the other hand “pop” the top down to make a mushroom cap. 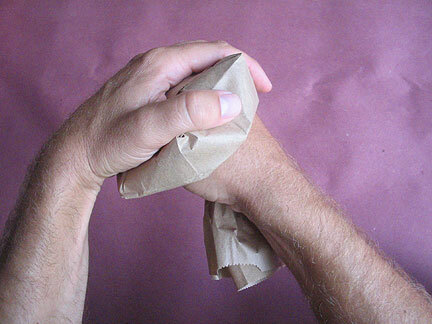 be sure not to pop it too hard or it will pop for real and ruin the bag. Okay, now take a bamboo skewer and place it up through the stem of the mushroom with the pointed side out. BE VERY CAREFUL. THE SKEWERS ARE VERY POINTY AND SHARP! 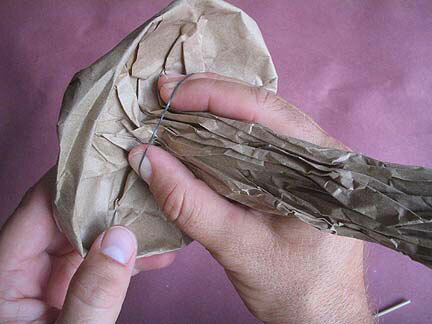 Squeeze the lower part of the bag into a stem shape. DON’T TWIST IT, just squish it. 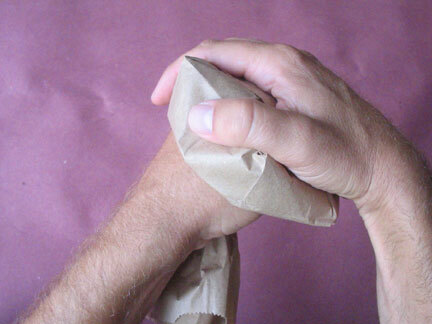 Grab the neck of the mushroom with one hand and flatten the top with your other hand. 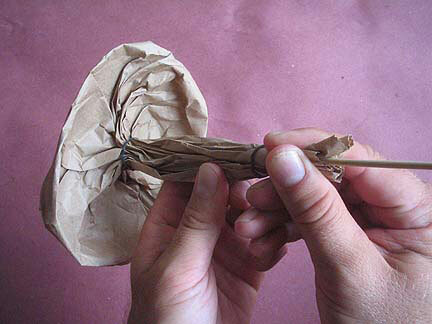 Rotate your mushroom a bit while doing this. This will take practice. 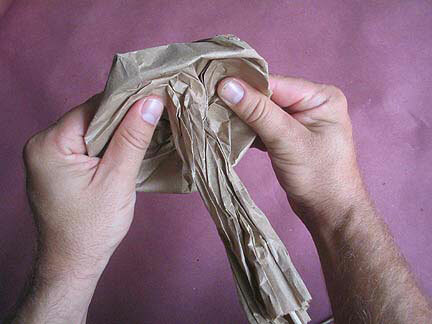 Once that step is completed, push the corners of the bag inward. this gives the mushroom a more rounded appearance. If not your mushroom will have square corners and no one likes a square cornered mushroom. Alright. 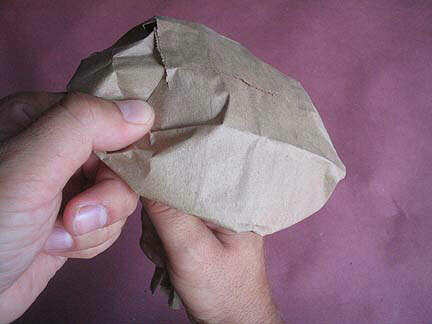 Now using your thumbs and forefingers, pinch and rotate the underside of the mushroom cap. This gives it a better mushroom shape. 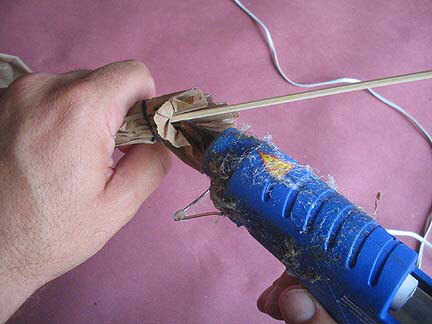 Now put one rubber band all the way to the top of the stem. Easy right? 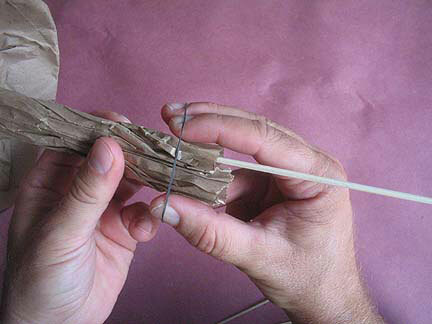 Pinch the bottom of the mushroom to squish the glue to the paper and skewer. 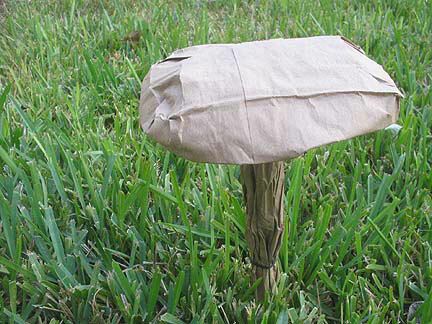 without the glue, your mushrooms will fly off the stick in a gust of wind. HEY! HOT MELT GLUE IS HOT. IT WILL HURT IF YOU GET IT ON YOU. I SHOULD KNOW. ASK HELP FROM AN ADULT IF YOU NEED IT. Your mushroom is now complete. Yeeay!! Carefully place it into the ground. Now make few hundred more. What else were you going to do with your day anyway? Make a bunch. You can put them in a pattern or make a natural looking crop of mushrooms. You can paint them or do whatever you want. Think like a mushroom and have fun okay? • Mushroom plantings around the world! This entry was posted on Tuesday, November 10th, 2009 at 1:33 pm and is filed under z4 spore. You can follow any responses to this entry through the RSS 2.0 feed. You can leave a response, or trackback from your own site. This is all too intriguing. I’d be thrilled to have lots more info! Thanks! this is fantastic! thanks for the demo!